Not far from here lives the Rose Princess in a kingdom ruled by her father the king. One morning she awakes to find a splendid package at the end of her bed full of gifts and a card from her father encouraging her to use the gifts wisely. Unaware of what lies ahead, the princess sets out on a journey of learning and adventure where she meets all kinds of colourful characters. Suddenly she realises that she has gifts that can help them, and she is faced with a choice: keep the gifts, or help others by giving her gifts away. In this beautifully illustrated, full colour, hardcover children's book, children embrace the heart of generosity and begin to make conscious decisions to share and give to others. They learn that they have the ability to lead and influence simply by being a positive example. Especially designed for children aged 4 to 8 years. "There are a lot of children's books on the market today, but only a handful are as engaging and captivating to kids as The Rose Princess and the Special Gift. It is itself a special gift, that is not only visually beautiful, but also tells a beautiful story with an important message. As a Dad, I want as many tools that help will me connect with my children and that help me pass on a lasting faith to them - this is one such tool." 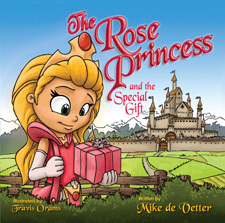 "The Rose Princess and the Special Gift is a delightful book that speaks to the heart of a child. Every small girl needs to hear from her dad that she is lovely and yes she is capable of goodness. This book communicates both of those messages. In a special way the affirmation of a father permeates the story and embraces the small princess in a world of imagination. Our own small granddaughters were captivated!" Mike's pathway to writing began with a diploma of Sport and Leisure - majoring on leisure. In his extensive 'research time' on the golf course, he decided he never wanted to grow up. His experience with coaching kids in his first job after university uncovered a new passion - to see young people reaching their dreams. His career path has involved working with youth, children and families for almost 10 years. He currently leads a vibrant church in Tauranga, New Zealand. Mike is also the co-founder and writer of Powerzone Productions, a children's teaching curriculum which is being used across New Zealand. The highlight of Mike's day is leaving work so he can hang out with his gorgeous wife and daughter - the beautiful Princess Rosie Grace.